DepEd School Calendar for SY 2017-2018 - DepEd Order No. 25, Series of 2017 (VIEW or DOWNLOAD) - Balita Boss! 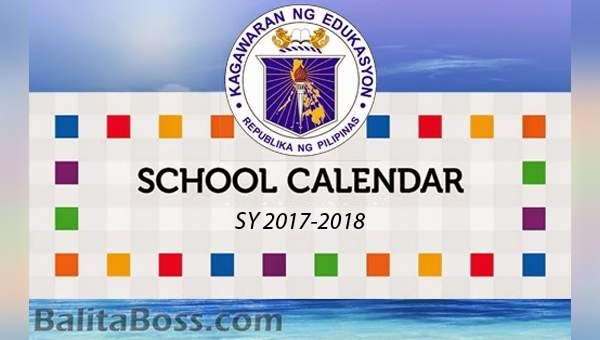 The DepEd School Calendar for School Year (SY) 2017-2018 is now available to view or download on this page. It was officially released by Department of Education (DepEd) Philippines on May 5, 2017. Based on the DepEd Order, the SY 2017-2018 shall consist of 204 school days. The opening of classes shall be on Monday, June 5, 2017 and the last day shall be on Friday, April 6, 2018. Check out below the DepEd School Calendar for School Year 2017-2018. To view the complete DO 25, s. 2017 or the DepEd School Calendar for SY 2017-2018, check the embedded file below. To download the full file which includes the Implementing Guidlines on the School Calendar for School Year (SY) 2017-2018, please click here or here.